‘What would happen if we were to open an old family album and discover that each photo, organized with maniacal care and love, had been torn and burned with permanent scars? Maybe we’d feel as we do in front of “Scars”, a series by young Londoner India Lawton (who graduated at University of Westminster with a masters degree in photography in 2012), which displays a technique that has surely been seen before, but is touching due to its presentation and subject matter. 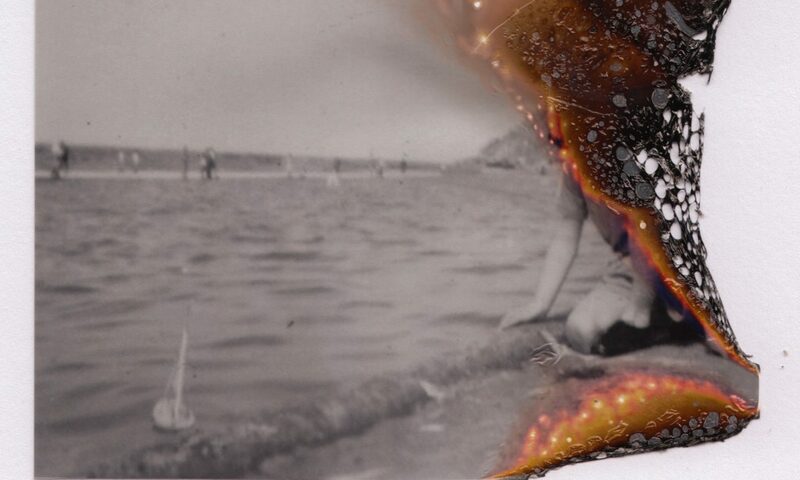 ‘In her photos all that remains are traces of a ghost family, decapitated memories, remembrances that have been burned forever, faces devoured by woodworms and unknown hands. “Who did this?”, we’d ask in disdain. To then discover that what India is showing us is something else. Something invisible. In spite of the devastating violence, indeed something remains. The photographs, though mangled, wounded and partly incinerated, resist. And they remind us that statistically they can survive any natural disaster far better than man. They have scars that whisper of an inevitable destiny, but they invite us to take pleasure in our dear remains for as long as we can.